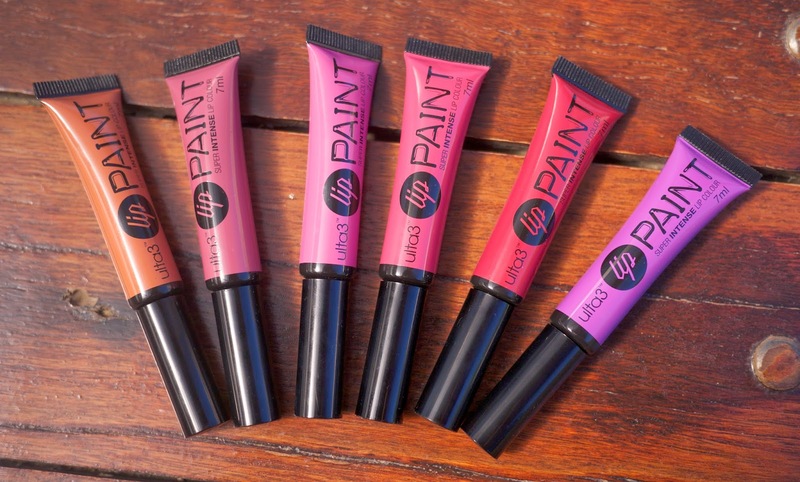 As you can see from the swatches above, all six of the Ulta3 Lip Paints are extremely pigmented. There are six colours available in total in the Ulta3 Lip Paints range, with the colours ranging from a dusty pink to a vibrant purple and everything in between! The swatches above were photographed after only one swipe of the colour and which is a great indication of of how opaque the colours are an how little is needed. I think the selection of colours is really nice, however I would've loved to see a paler shade of pink. From the range of six shades, there's only one colour that I would deem to be neutral, Manic Mauve, which may be of issue to some people. In saying that though, I love almost all of the colours so I don't really have much to complain about. 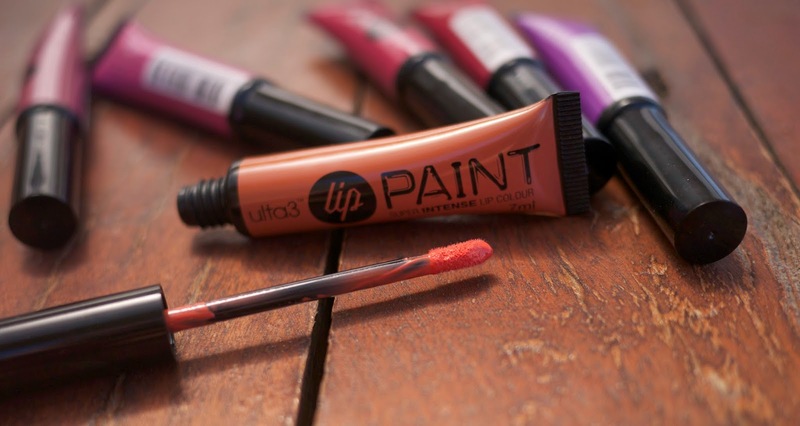 The Ulta3 Lip Paints* are housed in a traditional lip gloss type tube with a doe foot applicator which makes the application process really easy. The applicator has an extremely fine point so the lip can easily be filled and it's not too fluffy, meaning the product applies exactly where you intend it to. Something else to be noted is that a very limited amount of product is on the applicator at one time so there's no need to scrape the excess off. I've always found there to be the perfect amount! Ulta3's Lip Paints* are another addition to the multitude of liquid lipstick type products we've been seeing hitting the shelves lately, however they have a glossy finish which I find to be a lot more comfortable on the lips and, therefore, desirable. They don't necessarily have the lasting power of a matte lip cream or a lip stain but no one would expect that from a gloss! I have found that these last 2 - 3 hours on me without fading. At that point, the colour does start to fade but it does so evenly. A pet hate of mine is when a lip colour fades unevenly, first from the middle of the lip so you're left with a ridiculous lip line of pigment. Anyway, these don't do that and when they do fade, the gloss is the first thing to disappear so you're still left with the colour. Sure, these transfer onto glasses etc. so you may need to reapply throughout the day but they're so affordable and comfortable on the lips so that shouldn't really matter! The Ulta3 Lip Paints* retail for $5.95 and are available from Terry White Chemists, as well as another other retailer that sells Ulta3 products. 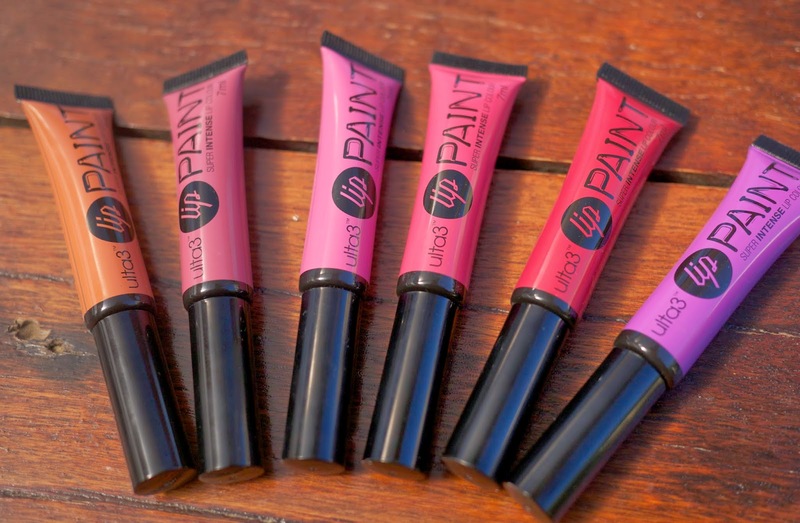 What do you think of the Ulta3 Lip Paints*? Have you tried them yet? Which colour appeals to you the most? I think I would stick to the mauve too. The rest of the colours are nice though but a bit bright for everyday wear for me. These look amazing, so bright and fun! I only see myself wearing the mauve one though, I never brave the bold colors. I don't think any of these colours would suit my (dark/tan) skin tone...hope your legs gets better btw! Gorgeous colors!! I will be checking these out! Hope you feel better soon!